What do quantum cryptography and the World Cup have in common? The answer is that both will feature at the Moses Mabhida Stadium in Durban, South Africa, next month. 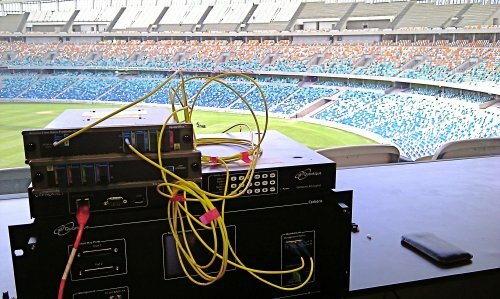 The eThekwini Municipality, which includes Durban, and the Centre for Quantum Technology at the University of KwaZulu-Natal (UKZN) have joined forces to install a quantum-cryptography secured telecoms link between the football stadium and the FIFA World Cup Joint Operation Centre in Durban. The system includes a dedicated optical fibre connection and the Cerberis quantum encryption system. Developed jointly by Australia’s Senetas and Geneva-based idQuantique, Cerberis is a quantum key distribution (QKD) system that allows two parties to secretly share random strings of bits that are used to encrypt and decrypt messages. The bits are encoded into a stream of photons that are sent down a dedicated fibre. Anyone trying to intercept the string must make a measurement on the photons. Quantum mechanics dictates that a measurement will cause an irrevocable change to the photons, which would alert the two parties to the presence of an eavesdropper. According to UKZN physicist Abdul Mizra, the system will be used to ensure the secure transmission of voice and data, including e-mail.So why do World Cup organizers need such a high level of security? "With all high-profile events, there is a security concern with regards to dignitaries and teams", explained Mizra. I suppose that’s fair enough, given that Barack Obama might put in an appearance. However, avid physicsworld.com readers will recall that just last week Canadian physicists claimed to have hacked an idQuantique system.You can read more about the quantumStadium and the related quantumCity project here.